Oct. 1925 175 The W.C.T.U. met in regular session at the [being?] church Oct 20 of 3. P.M. with the pres. in charge. Scripture reading by Mrs. German and prayer by Mrs. Hess. Treasurer was absent but report was as follows. Amount on hand $94, expense of sending delegate to convention would be nine dollars. Thank offering $20, blotter 3.60 - 61.40 An offering of $10 was voted on to be sent to the Benedict Home. 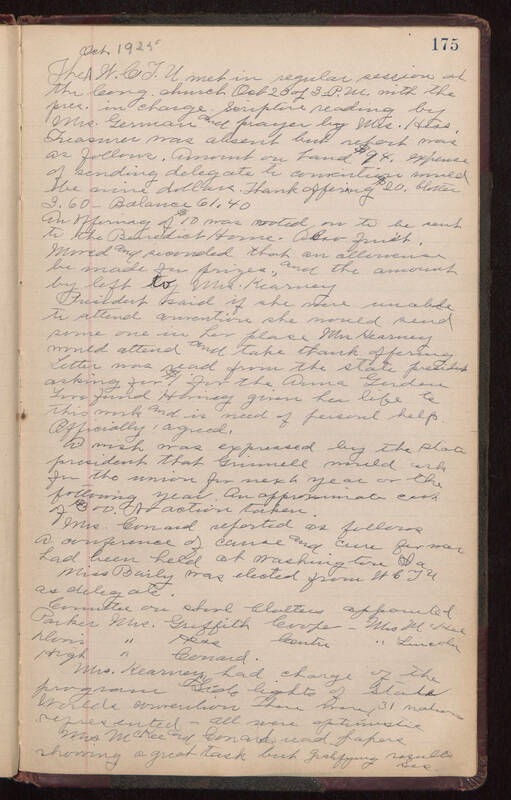 Also [illegible], moved and seconded that an allowense be made for prizes, and the amount by left to Mrs. Kearney President said if she were unable to attend convention she would send some one in her place Mrs Kearney would attend and take thank offering Letter was read from the state president asking for $1 for the Anna [Gerdeu Love?] fund having given her life to this work and is in need of personal help. Officially, agreed. A wish was expressed by the state president that Grinnell would ask for the union for next year or the following year. An approximate cost of $300. No action taken. Mrs. [Cunard?] reported as follows A conference of cause and cure for war had been held at Washington & a Miss Baily was elected from WCTU as delegate. Committee on [illegible] appointed Parker Mrs. Griffith [Cooper?] - Mrs McKee [illegible.....] " Lincoln Hugh " [Cunard?]. Mrs. Kearney had charge of the program Side lights of State Worlds convention there were 31 nations represented - all were optimistic. Mrs. McKee and [Cunard?] read papers showing a great task but gratifying results See.